Quite a nice piece from The Scottish Book Trust. 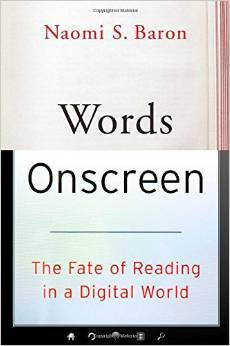 The author, Sasha de Buyl, starts off raving about the experience of reading on a tablet, then gradually enters one small objection after another which leads to her plumping for the p-book in the end. What she says about eye strain does strike me as true — though I have occasionally wondered if it is my aging eyes rather than the iPad which are causing the issue. Here’s a piece by Naomi Baron on the OUP blog talking about her multi-year survey of students’ reading preferences. She has just published a new book with Oxford. On the issue of concentration I have wondered whether the common response that concentrating on print is easier than concentrating on an e-book, is merely an artifact of training and conditioning. Even today we have all grown up using printed books in school, and having been made to concentrate on them; whereas iPad, iPhones etc. probably tend to be associated in our minds with entertainment. And this focus on printed books in education continues. Even the kids we are always being told spend “all their lives on their smart phones” use printed books at school. In New York City there’s a new business which has recently sprung up. You send a van to park outside a school and all the pupils pay you a fee to hold onto their phones during school hours because they aren’t allowed to take them inside. (This policy is now loosening up: individual schools can make their own rules on mobile phones.) Frankly if I am reading an interesting book on an iPad, I do not find I have any trouble concentrating. I think the survey data here may be subject to a tendency to give the expected answer. This interview with Professor Baron at The New Republic provides further detail. The trope of “digital natives” (our latest euphemism for kids apparently) preferring print to e-book continues rampant. Here’s a story from The Washington Post as an example of the genre. Like several recent pieces it is also provoked by Professor Baron’s new book. That students don’t like e-books for study isn’t really surprising to me. We recently had an undergraduate staying with us for four years while attending the CUNY system: he didn’t ever buy an electronic book (I don’t think one was ever recommended). They did have some tests on-line, but all the students, he said, would buy the textbook in printed form, most often as used books sold by the college bookstore. This graphic from The Washington Post story provides dramatic confirmation that our student was not alone. That this buying pattern is caused by concentration problems alone, I doubt. I think it possible that there are features of paper that just make studying easier: you can highlight* the book, write in annotations, explanations, translations and so on. The movement of your hand while you are reading does seem to intensify memory. I find the best way to learn a poem (except for singing it, if it has a melody) is to write it out longhand. Will we evolve to a point where the finger movements of typing on a keyboard to annotate our Kindle text will yield the same memory enhancement? Or is e-reading actually going to prove a passing fad? Neither, I suspect. I remain convinced we are going to live in a mixed e/p environment for many, many years. * Highlighting with a yellow magic marker is something US students all accept as utterly normal, but which one just doesn’t — or didn’t — encounter in UK. Yellow pages are American pages.